All over Europe, festivals take the lead in finding innovative ways to use resources intelligently, employ renewable systems and reduce emissions. Yet at these festivals, diesel generators are still the most employed source to provide electricity due to a large amount of power needed. Using diesel to generate electricity has big disadvantages: substantial CO2 emissions, noise annoyance of droning generators, and bad smell. With the latest developments in renewable energy, for instance vertical axis wind turbines, more efficient solar panels, improved batteries, now allow for an efficient and economically attractive approach to produce large amounts of power from sustainable resources only. 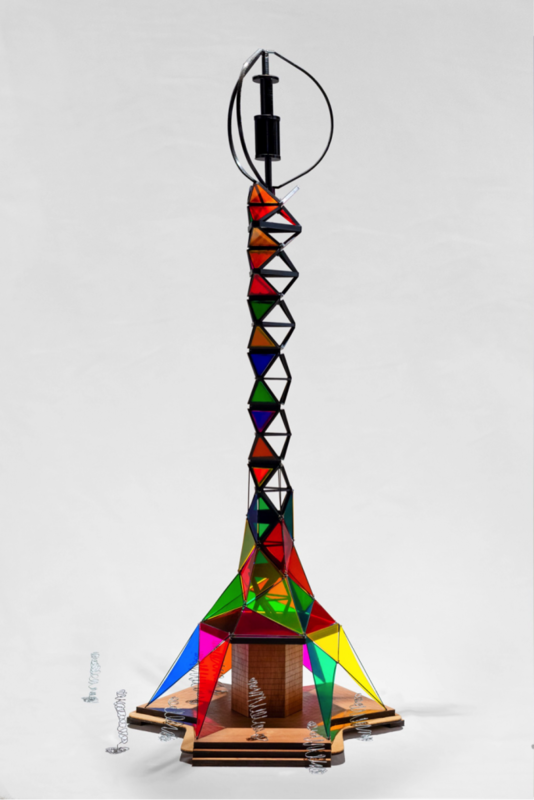 The Interreg PowerVIBES project introduces the GEM-Tower. This tower aims to reduce festivals’ carbon footprint by 20% by making diesel generators superfluous. Instead, affordable and reliable energy is produced from renewable resources wind, biomass, and solar power. To illustrate, if the Netherlands’ summer festivals cut their diesel consumption by 10%, over 1.000.000 litres of diesel and over 3,000 tonnes of CO2 is saved annually. This GEM-Tower combines a vertical axis wind turbine, PV panels, and a battery, all customized in a containerized unit and with a bio-fuel generator as backup. All are connected in a smart grid. Two of such transportable GEM-towers (with smart grid) will be built and tested on in total 16 festival sites. This extensive testing regime is essential as of large differences among festivals, as they operate under significantly different legal, technical, seasonal, locational, and environmental conditions. This process of reflection and feedback (with a loop of testing-analysing-adjusting-implementing after each test) leads to a (practically) universally applicable system, to be used in all countries of the NWE region. This energy production is completely clean. Therefore, the can be clearly visible on a festival site to reach an audience of millions that experiences this sustainable energy concept. Double 2 is an independent and dynamic media production company, combining content with infectious enthusiasm. Their knowledge and many years of experience makes Double2 of distinctive value to all communication aspects in the project, starting from strategy and plan development to execution and monitoring. Double2 will also bring in their extensive network as well as expertise regarding practical aspects of festivals, as they also organise many sustainability events at different festival sites.